Many businesses contract for snow removal but don’t plan on ice. 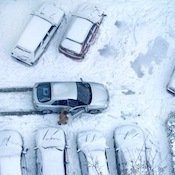 We can help, even if you have a contract with another snow removal service. The ice is here, and it doesn’t look like we’re going to get a thaw soon. That means increased danger of liability from parking lot and sidewalk accidents. If you have a contract with Grand Rapids Landscape Management but forgot to contract for de-icing, give us a call at 616.245.7180 or use our contact form. We’ll turn your ice rink into a much safer place. If you have a contact with another snow removal company and they don’t offer de-icing services, no problem. You can still give us a call or send us a message. We’d be glad to give you an estimate and get it done quickly.